Starter plants are species that you can start in a small pot and then transition to your garden or into a larger pot. African violets make superb starter plants because these flowers begin very small and range in size and growth patterns depending on the variety. Some African violets can get quite large, while other species grow slowly. You can start these plants in a small pot and place them on your table near a sunny window or on your kitchen windowsill. There are hundreds of different varieties classified into four main groups: miniature, semi-miniature, standard and large. Miniature African violets grow 6 to 8 inches in diameter. The foliage is dark green and fuzzy in some species. The colors vary greatly between deep purple, blue and pink. Some small species produce flowers that are white with pink rings around the center. Iowa Sate University notes that African violets require a moist environment and well-drained soil. 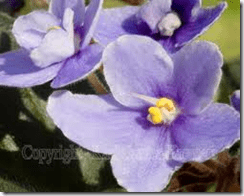 All types of African violets thrive in soils with a pH between 6.0 and 7.0. Water your African violets daily to ensure that the plant is getting enough moisture. These plants also thrive in the sunshine, so place your potted African violets near a sunny window. All types of African violets grow well in Arizona and California because of the sunny weather throughout the year, but if you live in rainy areas of the Northwest you can’t grow African violets without some type of artificial florescent light during the winter months. Semi-miniature African violets also grow 6 to 8 inches in diameter. These plants are basically the same size as miniature varieties, but the foliage is sometimes larger depending on the species. There are many sub-species and several variations. Some semi-miniature African violets have fuzzy leaves, while others have smooth, dark green foliage. The colors vary between light and dark purple and pink. Standard African violets can grow 8 to 16 inches in diameter. Standard African violets produce large vibrant blooms and oval-shaped foliage that is usually much larger than the flower itself. Transfer your standard-sized African violets to larger pots as they grow. You can place these violets on the porch during the warm spring and summer months, but you must move the plant indoors when temperatures drop below 50 degrees. The large African violets can grow more than 16 inches in diameter. You must transplant large African violets to larger pots as the plant grows. These violets produce large, oval-shaped, fuzzy foliage. The color spectrum ranges from dark purple to pink to light blue; some violets are a mix of different colors.